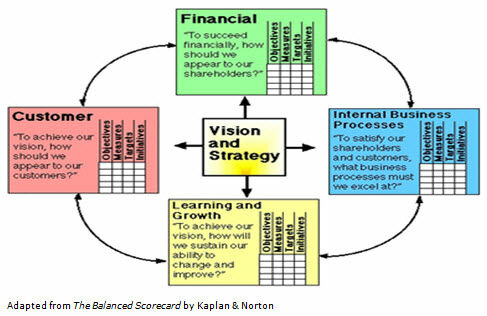 The balanced scorecard is a strategic planning and management system that is used extensively in business worldwide to align business activities to the vision and strategy of the organization, improve internal and external communications, and monitor organization performance against strategic goals. It was created by Drs. Robert Kaplan and David Norton as a performance measurement framework that added strategic non-financial performance measures to traditional financial metrics to give managers and executives a more ‘balanced’ view of organizational performance. The balanced scorecard has evolved from its early use as a simple performance measurement framework to a full strategic planning and management system. The balanced scorecard transforms an organization’s strategic plan from an attractive but passive document into the “marching orders” for the organization on a daily basis. It provides a framework that not only provides performance measurements, but helps planners identify what should be done and measures it, and thereby enables executives to truly execute their strategies. It assists organizations to clarify their vision and strategy and translate them into a plan. It provides feedback around both the internal business processes and external outcomes in order to continuously improve strategic performance and results. When fully deployed, the balanced scorecard transforms strategic planning from an academic exercise into the nerve centre of an enterprise. By focusing not only on financial outcomes but also on the operational, marketing and developmental inputs to these, the Balanced Scorecard helps provide a more comprehensive view of a business, which in turn helps organizations act in their best long-term interests. This tool is also being used to address business response to climate change and greenhouse gas emissions. Organizations were encouraged to measure, in addition to financial outputs, those factors which influenced the financial outputs. For example, process performance, market share / penetration, long term learning and skills development, and so on.